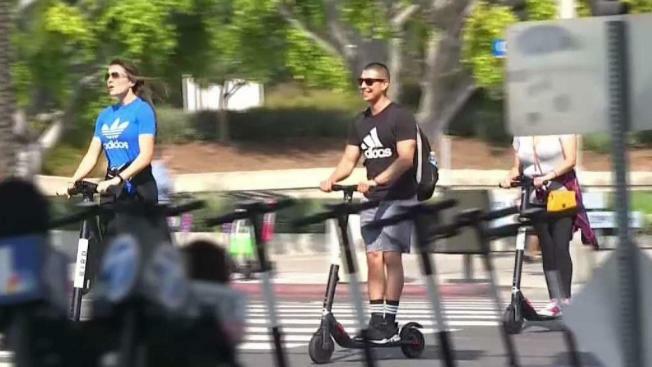 Broken Limbs, Teeth Lead to E-Scooter Class-Action Lawsuit in Calif.
Nine people have joined a class-action lawsuit filed on Friday in Los Angeles County Superior Court against e-scooter companies Bird and Lime, along with their manufacturers, alleging "gross negligence," attorney Catherine Lerer told NBC4. People in the lawsuit, along with several others represented by the attorney, listed their injuries on the personal attorney's website with graphic images that detail the injuries, which occurred in San Diego, Santa Monica, Oakland, Los Angeles, Venice, West Hollywood and Westwood. Broken arms, facial injuries, broken legs, broken teeth, concussions, lacerations and other injuries are detailed on the website. Several people claimed to have required surgery. The lawsuit alleges that the e-scooter companies contributed to injuries in multiple ways by "dumping" the transportation devices on streets without appropriate warning, The Washington Post reported. Multiple plaintiffs claim that they were struck by e-scooters while walking. In one incident involving David Petersen, 62, the lawsuit alleges the licensed street performer was struck by an e-scooter while performing an act on the Santa Monica Pier, where e-scooters are not allowed. "I was like, 'Get the number of that motor vehicle that hit me,'" Petersen said on Monday. "But guess what? They don't have a license plate. There's no way to identify them." Petersen broke his arm and suffered a ruptured bicep that required surgery. The rider of the Bird scooter rode away, and the incident was being called a hit-and-run, with Petersen and Lerer alleging that Bird had refused to provide the rider's name when requested. "I'd like to walk without looking over my shoulder every few seconds," Petersen said. "Class action attorneys with a real interest in improving transportation safety should be focused on reducing the 40,000 deaths caused by cars every year in the U.S. At Bird, safety is our very top priority, and it drives our mission to get cars off the road to make cities safer and more livable. The climate crisis and our car addiction demand a transportation mode shift to cleaner, affordable vehicles. Shared e-scooters are already replacing millions of short car trips and the pollution that comes with them, and we at Bird will continue to work with cities to help them redesign their transportation networks so that they are safer and cleaner." "Lime received the complaint recently and we are in the process of reviewing it. While we don't comment on pending litigation, safety has always been at the very core of everything we do at Lime -- as is our mission of reducing cars from city streets and making them safer and greener for pedestrians, bike and scooter riders alike. Lime prides itself on always taking proactive steps relating to safety wherever we have a presence."